Most everyone knows the history of the Mini, so I'll skip the details. It was a car the truly revolutionized the auto industry. The Italian Innocenti company teamed up with BMC in 1960. The idea was for Innocenti to build and sell BMC based automobiles in Italy. Some, like the Innocenti Spider sports car, were unique designs based on BMC platforms, others, such as this Mini Cooper, were copies of the BMC model with some minor changes. The differences between the BMC Mini Cooper and the Innocenti Mini Cooper are few. The grill is different, the lights are made by Carello, and most significantly, it has a different dashboard. 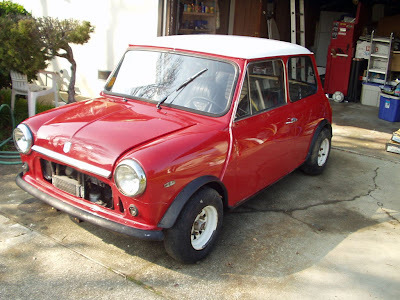 The Innocenti Mini being offered on Craigslist is an easy project. The car needs its carbs rebuilt and some trim pieces installed. The seller states "The following needs to be re-installed; Grill work, headlight, battery, mirrors, some trim, inside door handles, dome lens covers, etc." Using the word "reinstalled" makes me believe those parts are included with the car. As for the body, there are a couple of small rust spots on the front fenders (but check the car thoroughly, Minis can rust in hidden places) and the seller says "the driver's side skid panel needs the seam tacked before the trim is put back on". The car has sat in a garage since 1988, so all the fluids will have to be changed, new brakes would be a good idea and it needs a good cleaning / detailing. (I'd put on some different wheels, too) All-in-all, nothing serious needs to be done to this car. This car would be a hit at any British or Italian car show. Best of all, it would also be a blast to drive. Located in Sacramento, CA, click here to see the Craigslist listing. Inno-Mini-World has some useful info on their site. Click here to find it. This site, I'm not quite sure what it's called, has some nice pictures of the Innocenti Mini Cooper. Written mostly in Dutch with some English here and there, it's a fun site to prowl around. Click here to find it. A footnote: In 1974 Innocenti introduced a rebodied, 3-door hatchback Mini, styled by Bertone.Originally it kept the BMC underpinnings and engines. In 1982 the BMC underpinnings were replaced and the engine was now a Daihatsu 3 cylinder. The car was completely discontinued in 1989. The later cars were exported to Canada where they still have a small but fanatical following. Always wanted a Mini. Amazing car, even with all the strides were making in low cost, reliable and cheap to run cars, the Mini after all these years still fits the bill, not perfectly, but good enough for me. Since moving to the US I am shocked at the high prices, even this one in Sacramento, its close by but from the pictures I can see some rust. If you can see the rust then I am guessing there are more issues under the skin. I'd bet Italian made Minis rust worse than the English ones! Were these ever oficially imported to the US? Innocenti never imported cars to the US. Minis sell for so much in the US because we never bought many new. There are few left.